Jesus of Nazareth is the pivotal figure of Christianity and is seen by Christians as the Messiah from the Old Testament. He is also seen by Christians as the son of God. Jesus was a Jewish man who preached to those who would listen. He was crucified by the Romans and rose from the dead a few days later. The following page has Jesus Chris themed crafts. 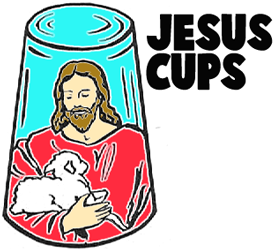 To make this beautiful Jesus cup, find a clear glass or jelly jar or a small glass dish, an assortment of jesus pictures cut to fit inside glass, scissors, patching plaster (a one-pound package should fill about 12 small glasses), knife, 1 piece of felt or blotter paper large enough to cover drinking side of glass, and glue. Allow child to choose the picture he would like for his picture glass. Moisten the picture and place it face down in the bottom of the dish or around the side of the glass. Mix patching plaster with water until it is thick. Fill glass or dish, being careful not to let the picture slip. Smooth the top of the plaster with a knife and allow it to set until hard. Cut a piece of felt or blotter paper large enough to cover top of glass and glue it to the plaster. Turn the glass upside down and place on dresser or desk. 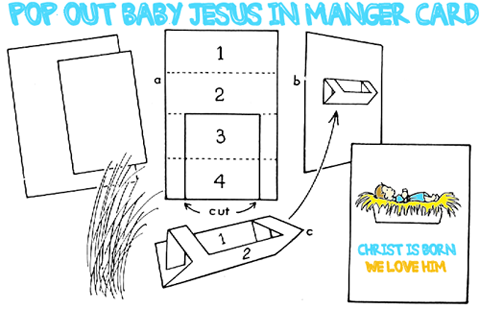 Look at the diagrams above to make a pop-out manger cradle for baby Jesus to lay in. The paper sizes are 9x12 inches and 9x6 inches. The smaller piece of of paper should be folded in half and then unfold. Then fold the bottom to the center fold. And then fold the top to the center fold as well. Unfold and you will have 4 sections of paper....1, 2, 3, and 4. Cut part of section 3 and 4 out as seen in the sketch above. Now glue section one onto the bigger piece of paper as seen in illustration b. Then bend it naturally to glue the tabs onto section 1 as seen in illustration c. Now you have the manger cradle. You can fill the cradle with grass or cotton or ripped paper or just print out paper baby jesus and paper hay. You can cut out the paper jesus and stick him inside the cradle and cut out the hay and stick it around him. To make this, just grab 2 pipecleaners and twist and turn according to the instructions above. Just bend like a cursive letter 'e' (picture a). 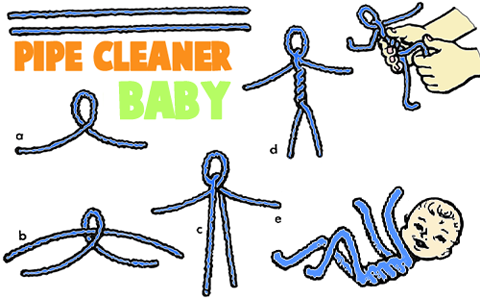 Stick the 2nd pipe cleaner thru the 1st pipe cleaner (picture b). Twist that 2nd pipe cleaner down like an upside down letter 'u' or 'v' for legs (picture c). Then twist that pipe cleaner until it looks like (picture d). Then twist and turn the arms and legs the way a baby would have them. 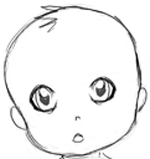 Glue or Scotch tape face to doll - you can get one from a magazine picture or use this baby drawing. Place in manger bed and cover with small piece of cloth. 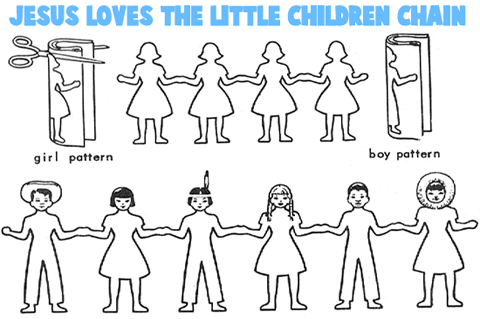 It is a LOT of fun to make these children chains and it can illustrate a story of how loving, caring, and understanding Jesus is to ALL children, no matter what religion, race, or religion they are. Fold a piece of paper in half 3 times. Then draw a girl or boy shape on the paper along the hinge. To make many, many dolls, you can tape them together in a long chain. For this craft, you will need a 10-ft. strip of wrapping paper or craft paper, thumbtacks, poster paints and brushes, cutouts of children, large figure of Jesus, and paste. Start off by tacking the paper on the wall low enough for children to reach. Explain to the children that they may make a picture of the happy time when the boys and girls went to see Jesus. Let them paint a scene of trees, grass and flowers—something of their own interpretation of the pathway where the children ran to meet Jesus. Perhaps some of them will want to paint birds in the picture. 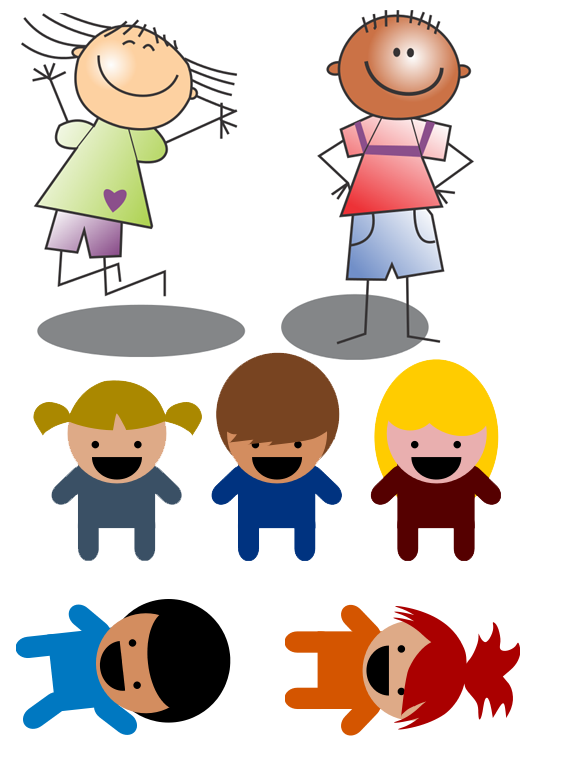 Provide cutouts of children and a figure of Jesus for the children to paste on the scene. 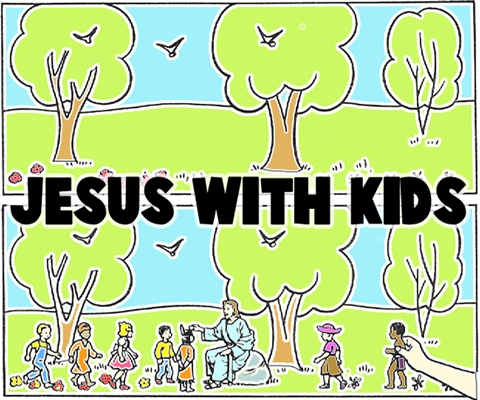 If you don't have any pictures, here are some printouts to use - Jesus and Kids ... More Kids. 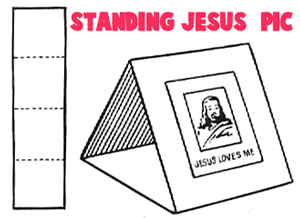 To make a standing picture of Jesus Christ for your dresser or desk, you will need the following materials : 1 strip of colored construction paper 3" x 12", pencil, ruler, paste, scissors, and 1 picture of Jesus Now to actually make the craft, fold the strip of colored construction paper across middle. Open. Fold each end to center crease, to make four sections, as pictured above. Overlap two end sections and paste thesetogether to form a triangle, as seen above. Child may paste Jesus' picture on one side of triangle. You can write something like 'Jesus Loves Me!' under his picture. You will need a roll of white shelf paper tacked at eye-level on the wall, paste, pictures of the following cut from used greeting cards: flowers, birds, animals, butterflies, trees, children, and Jesus (or you can print them out from the Internet). The children may paste the greeting card pictures on the shelf paper to make a mural showing Jesus' love and care. Talk with the children, as they paste on the pictures, about the Lord's ability to do all things. Print the words, "The Lord can do everything" (from Job 42:1,2), at bottom of picture. To make these framed Jesus pictures, you will need 12 popsicle sticks, cardboard, glue, picture of Jesus from a greeting card or other place, shellac and brush, piece of adhesive tape and 4" length of yarn. Carefully glue the picture of Jesus to the cardboard and allow to dry. Measure 3/4" from edges and arrange four of the sticks for a frame around the picture. The ends of the sticks should extend about 1/4" (see sketch a). Glue in place. Add two sticks to the frame (top and bottom), placing them about half the width of the sticks underneath, and glue securely. Add the sticks to the opposite sides and glue. Continue adding sticks around the picture until all sticks are used and frame is completed (sketch b). Shellac frame carefully. When dry, tape piece of yarn on the back for a hanger (see sketch c). Baby Jesus Scene Crafts Activity for Christian Children - A simple tutorial that will show you how to make the famous Baby Jesus Scene. Be Like Jesus Mirror Crafts Activities - Learn how to make this special Jesus mirror with your child by following these instructions. Burnt Match Cross Craft - Follow these instructions to make a Cross from burnt matches. Celebrate Jesus! 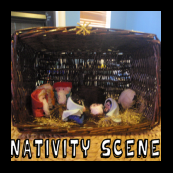 Craft Project for Kids - Celebrate the birth of Jesus by remaking the Nativity scene. Children's Bible Lesson Boat for Jesus Stories, the Disciples and Paul's Missionary Journey's Ship - This craft teaches children about Jesus’s disciples and Paul’s Missionary journey. 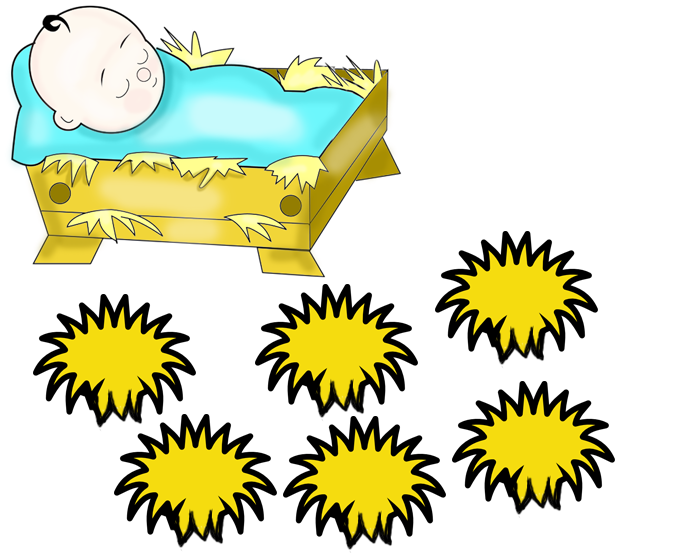 Children's Bible Lesson Support for the Nativity : the real Christmas Story : Make a Manger for Baby Jesus - This is a wonderful craft that teaches children about what happened the night Jesus was born. Clay Pot Jesus Arts & Crafts Projects - Find out how you can make a Jesus decoration from a clay pot, wooden ball, felt, gold glitter glue, paint, black marker, white craft glue and scissors. Foam Jesus Fish Arts & Crafts Ideas - Learn how to make a Jesus Fish sign from multi-colored fun foam. Genealogy of Jesus Wheel - This is a great Jesus craft for Sunday School, Easter or Christmas. Holy Family Picture Craft for Children - Design a wall picture of Mary, Joseph and Baby Jesus by following these instructions. How to Draw Jesus - This video tutorial will show you how to draw Jesus. How to Make a Jesus Feeds the 5,000 Bible Craft - A fun craft that teaches children how Jesus fed 5000 people. Jesus Pantyhose Baby - Make a baby jesus with an old pair of pantyhose. Find out how. Jesus Arise! - Learn how to make this Jesus Arise craft. Jesus Fish Beaded Safety Pin - Use this free Jesus Fish pattern to make a beaded safety pin. 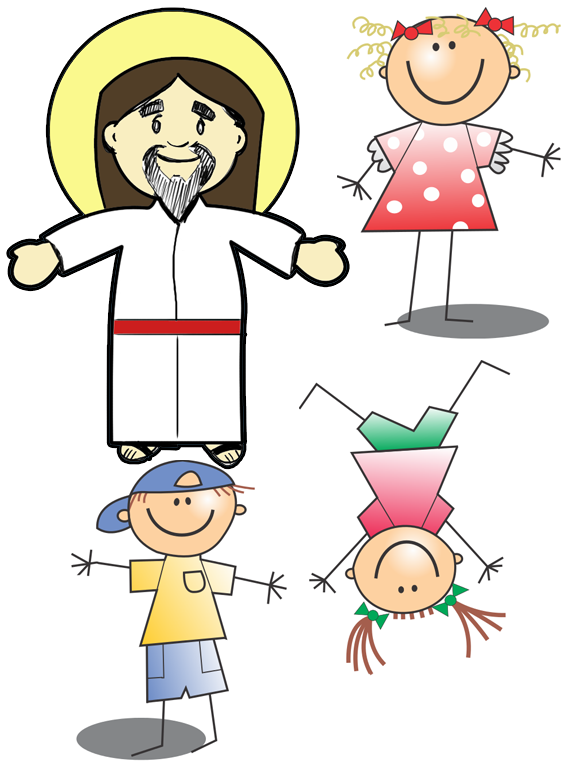 Jesus Loves You Balloon Crafts Project (PDF)- Learn how to make these 'Jesus Loves You' Balloon crafts project. “Jesus Loves You” Pop-Up Card Crafts Activity - Follow these instructions to create a “Jesus Loves You” Pop-Up Card. Jesus Pillow Arts and Crafts Activity - Find out how you can make a Jesus pillow by following these instructions. Jesus Toilet Paper Roll Craft for Kids - Make a Jesus craft from a toilet paper roll, your printer, paper, scissors, and glue. Jesus Walks on Water Paper Craft - Learn how to make this Jesus Walking on Water Paper Craft and Puppet with the following craft instructions. Paper Bead Cross Necklace Crafts Activities - Learn how to make this cute cross from paper beads. Picture It All For Jesus Bible - This is a great craft for Sunday School, Easter or Christmas. Pony Bead Jesus Fish - Decorate your window with this beautiful Jesus Fish made from pony beads.